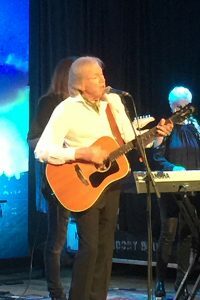 If you are a Moody Blues fan, then most likely you will be seeing one of Justin’s solo shows. He drew the crowd in and he gave them what they wanted to hear. Mike Dawes and Julie Ragins accompanied Justin. I have a special connection with Justin. Not many knew that Justin was the Best Man at my wedding to record producer, Tony Visconti. Tony had produced a couple of Moodies albums in the mid-80s that gave them some hit singles like YOUR WILDEST DREAMS & I KNOW YOUR OUT THERE SOMEWHERE. @City Winery to a Sold Out crowd.